With a little less than 200 countries this is a small world, but with just 59 Division I hockey programs in America, the league is truly small. More teams make the NCAA basketball tournament than there are schools that have a chance to make it to the Frozen Four. So when looking at Quinnipiac, Yale, St. Cloud State and UMass Lowell it is no surprise that there is some kind of direct relationship. From 1992-96, Quinnipiac assistant coach Bill Riga was spending his time on the ice for Lowell. Riga was most successful in his final two seasons, scoring nine goals and adding 12 assists. After his playing career ended, Riga made his way back to college hockey as a coach for the team the Bobcats knocked off in the East Regional finals, ECAC foe Union College. After spending five years with the Dutchmen, Riga was hired at Quinnipiac in 2008. Now 20 years after he first stepped on the ice for Lowell, his former team and the one he coaches for now are preparing for college hockey’s grandest stage. Lowell is among the greatest stories in college hockey this season with a coach that has one of the greatest stories in college sports over the past three seasons. After winning just five games his first year with the River Hawks in 2010, Norm Bazin led his alma mater to a 24-13-1 record in 2011. The turnaround earned him Hockey East and New England Hockey Writers’ Coach of the Year award. During Riga’s sophomore season at Lowell, he and Bazin were roommates. With the two coaching in the Frozen Four they have the chance for ultimate bragging rights. “Being at another school competing we obviously want to win it but on the other hand it is good to see the alma mater succeed,” Riga said about his former teammate and his old team. When asked about their time together, Riga showed an honest admiration for a player and more importantly a friend that he learned a lot from. In 2003, Bazin wasn’t fighting for a national championship; he was fighting for his life. During his tenure as an assistant coach at Colorado College, Bazin was struck by a drunk driver who was driving on the opposite side of the road. The accident severed his aorta and sent him into life-saving surgery that lasted half a day. Doctors eventually placed Bazin in a medically induced coma. The two as coaches, at least to the rest of the country, have found themselves in a similar position as they did when they were skaters. You’d be hard pressed to find someone outside the Quinnipiac or Lowell locker room that thought either team would be where they are today. Riga says that when he and Bazin played together, the team’s mentality was much different than the teams they played against. 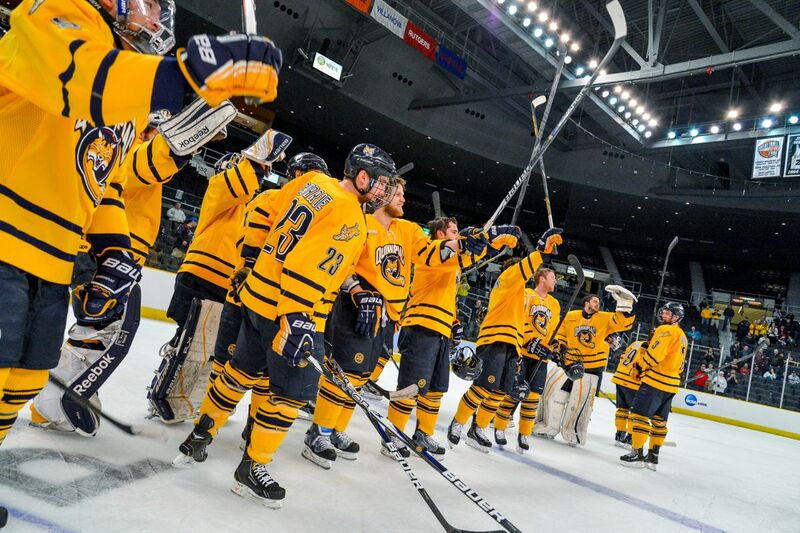 Over the course of the season Quinnipiac players and coaches alike have admitted that they don’t have the best hockey players in the country, but as a team they are hard to argue against. Riga thinks that Bazin brought that same mentality to Lowell when he took over the program in 2010. Now just three full seasons later, Lowell is heading to the Frozen Four with a chance for a national championship. In the few minutes Riga spoke he had nothing but positive things to say about Bazin, that was, until the possibility of meeting in the national championship was brought up. Best wishes. Now get it done Bobcats!